"The faces of the bootleg DVD pirates hit with 10-year-long ASBOs have been plastered on posters in a Hackney supermarket. The signs show the names of the seven-strong Chinese gang banned from plying their illegal trade. They also emphasise the links between the dodgy DVD trade and the funding of organised crime. It is the first time the anti-piracy organisation, the Federation Against Copyright Theft (Fact), has used posters in such a way. 'This poster campaign should leave no one in any doubt of the penalties for selling counterfeit DVDs,' said Kieron Sharp, Fact's director general. The gang plagued Tesco's car park in Morning Lane until the seven were arrested on February 1. A week later, the seven were given Anti Social Behaviour Orders at Thames magistrates' court. The raid was a joint initiative between the police, Hackney Council, Fact and immigration services. On Wednesday last week, the team of officers involved in the operation was commended in a ceremony at the town hall." I may be missing something here but why the massed mutual back-slapping? Those dodgy DVD vendors have been around for months if not years, not only in the Tesco car park, but up and down the Narroway, even popping in to Percy Ingle's on a few occasions when I've been gnawing on a bacon sandwich there. Smiling, only mildly annoying and utterly open about what they were doing, they'd become part of the central Hackney scenery. I had long been amazed that they hadn't been nicked in the normal way simply for peddling illegal merchandise. Seems it's taken a massive, four-pronged, multi-agency pincer-movement to get a mere ASBO - not even a criminal conviction - slapped on them along with the launch of some waste-of-space name-and-shame poster campaign. This merits an award ceremony in the Town Hall? Sorry, I don't get it. Can anyone explain? Here's my Fourthborn (main pic, right) and a friend close to Springfield Marina where a regatta took place this afternoon. 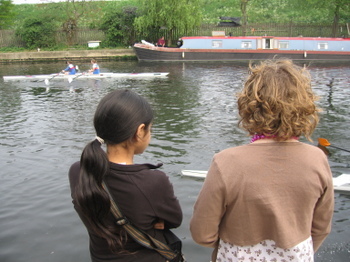 It was a good day out: nice weather, a walk along the towpath, egg and chips at the cafe and a series of races rowed hard but in the best amateur spirit. As ever, the riverside scene provided compelling overlaps between different worlds: assorted Hackneyites both spectating and participating alongside others with a more Home Counties air; further down the towpath Orthodox Jewish children peeped through garden fences of houses at the very foot of Stamford Hill or, in the case of a group of girls, were allowed to roam and pick flowers after absorbing a stern warning about safety from their ringleted father; stewards with megaphones and clipboards wore double-breasted blazers and daft hats. All very gently and engagingly discordant, at least if you're struck by that sort of thing. The cafe did good business - so good they'd run out of bacon and sausages by 2.30. I hear there will be a second regatta later in the year. Might see you there. Don't these break your heart? I saw this one in Rushmore Road the other day. 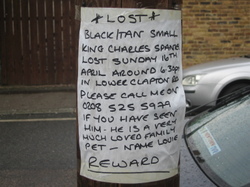 Hardly a week goes by without some similar lost pet plea appearing on a local lamppost. When they refer to a cat, my first suspicion is that it's wandered of its own free will, cats being the fickle things they are. With dogs, I'm more likely to suspect theft. Sad business. I hope Louie shows up. Read about the court case about the Mr and Mrs Mellon, he being the heir to a $4 billion oil and banking fortune, she being the Jimmy Choo shoes empress? Plough through this account and, lo and behold, you'll find a name check for a dodgy Hackney copper. 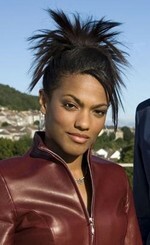 We all love Doctor Who in our house and we all love his new assistant Martha Jones, especially as - like all the best people - she's a product of Hackney. The one thing I don't like about Martha's arrival is the "love interest" aspect of her relationship with the Doc, a theme I explore in this piece for The Guardian today. But guess what? While researching the Guardian piece I discovered another Hackney connection. The first ever Dr Who episode, shown in 1963, was partly set within the borough's boundaries. The Doctor's first assistant was his granddaughter Susan Foreman who attended a fictitious Shoreditch secondary school called Coal Hill. Such was her unearthly brilliance in the classroom that a couple of her teachers followed her one day. She went into a Shoreditch scrapyard where they found her talking to an eccentric old man in a police box that was - wait for it! - really, really big on the inside! What's more, the Doctor returned to the scrapyard in 1985 and 1988. I've always said that Hackney is the centre of the universe. How much more proof do you need? "A SHOCKING number of staff at Homerton University Hospital have been attacked by patients and their families. Figures published last week show that one in 10 doctors, nurses and other members of the 2,500-strong hospital staff was punched, kicked, slapped or spat at last year. As well as violence, one in four staff was bullied, abused or harassed by patients over the same period." The data are included in the annual survey of NHS staff by the Healthcare Commission. I find them utterly astounding, depressing and enraging. Will try to track more details soon. "Dutch-born Eelko Moorer has designed a pair of boots from which a Tube traveller can hang upside down - bat-style - from the hand strap rails inside Underground trains." And where is Mr Moorer's studio? Be not at all surprised by going here. A housing consortium that includes contractor Durkan has won a £400m contract to regenerate eight Hackney estates. More here - though not much more - and more about Durkan here. Now here's a deserving pub: quiz nights, music, Sunday dinners, charming proprietors called Joyce and Steve, popular with the better class of person (i.e. I know a few of them). Joyce and Steve have a problem, though. 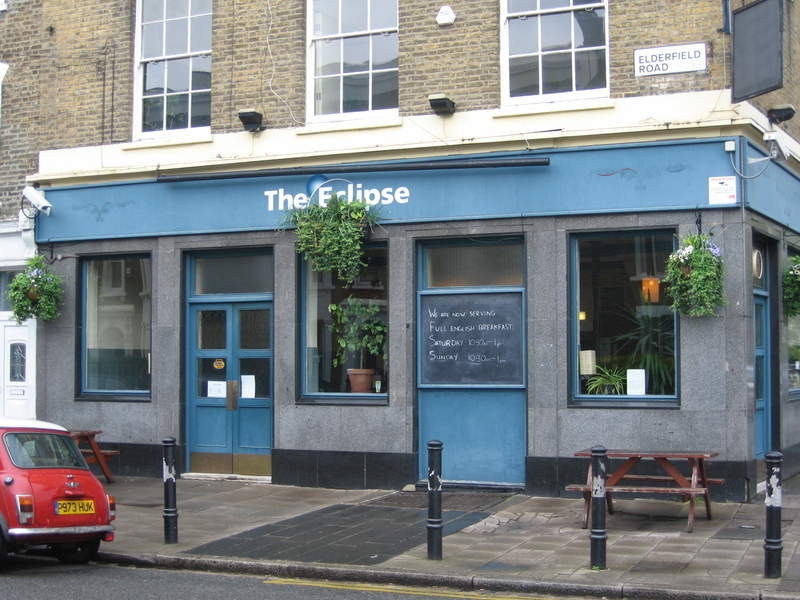 There's a small chain of cocktail bars each located in some riff-raff part of town - Knightsbridge, Wimbledon, Notting Hill, you know the sort of thing - and all of them are called The Eclipse too. It seems their owners have a legal monopoly on the use of the name and, apparently, nothing better to do with their time than make life difficult for The Eclipse in Elderfield Road which, presumably, they see as a threat to their "brand integrity" or some such guff. Result? Joyce and Steve need to come up with a new name. They haven't managed it so far and neither have their customers. Any ideas, dear readers? If so, let me know in a comment or by email. 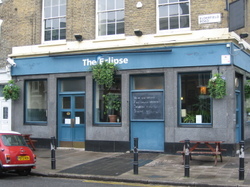 Or phone the pub on 020 8986 1591. I've yet to meet Cllr Vernon, who represents Queensbridge ward for Labour. The nearest I've come to doing so was attending the same meeting about black children and education, held at the Round Chapel last autumn (I refer to that meeting in this recent article for Comment Is Free). Thanks to the (deeply unimpressed) Stoke Newington Kris, I am familiar with his view about apologies for slavery. Otherwise, I know little of his opinions and broader political philosophy except what might be deduced from his membership of various organisations. One way in which I'd like to develop this blog is by inviting people - yes, even politicians! - to contribute guest posts on subjects close to their hearts. So I'm going to send Cllr Vernon a link to this entry and see if he responds. I hope he does because he sounds like a solid citizen and no blog can attract too many of those.